■ PERFECTLY TIGHT, WRINKLE-FREE SHEETS: Forget about curled, wrinkled, slipping sheets that give you a headache every time you change side in your sleep and opt for the neatest, wrinkle-free bed sheets, held tightly in place with this high-end 2-pack bed sheet strap set! Enjoy the luxury of perfectly tidy bed sheets, pinning them down with SheetLock sheet straps and forget about messy bedding! ■ TIGHTEST HOLD MATTRESS STRAPS: Made of unmatched durability ELASTIC MATERIAL to ensure longevity and with STURDY PLASTIC PEGS that will securely hold the sheets tight on the mattress, these bed sheet garters are coming to add convenience and comfort to your sleep! The innovative design of these adjustable sheet straps will make sure your sheets stay tightly put, without causing the slightest damage to the fabric! 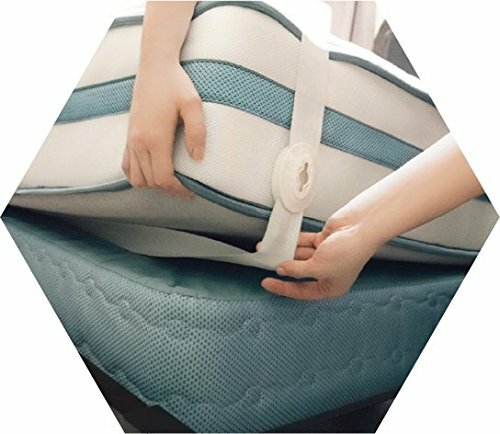 ■ NO NEED TO LIFT HEAVY MATTRESSES! Unlike most sheet grippers on the market, SheetLock sheet corner holders do not require lifting your mattress every time you change your sheets! Install them in no time by attaching the elastic bands horizontally at the HEAD and the FOOT of your bed, put the sheet OVER the sheet straps and pin them down with the button! An ONE-HAND installation, ensuring perfectly tight sheets in a matter of seconds! ■ PERFECT FOR ALL BEDS: Perfectly adjustable to ensure snug fitting bed sheets, these premium sheet suspenders come in TWO SIZES for top efficiency in FOAM, AIR or ADJUSTABLE mattresses. Pick SMALL or LARGE and make yours the most ergonomic bed sheet holder for all FULL, KING, QUEEN, TODDLER or HOSPITAL bedding sets! ■ NO QUESTIONS 100% MONEY BACK GUARANTEE: At SheetLock we take pride in the quality and craftsmanship of our bed sheet grippers and always strive to improve them! If you are not positively thrilled with our elastic bed sheet straps set, we will return your money in full- no questions asked!